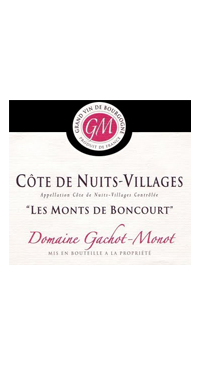 The wines of Gachot-Monot represent excellent value in Burgundian wines. They offer an outstanding price-to-quality ratio. This fifth-generation vigneron and his Danish wife, Lise, farm twelve hectares in the village of Corgoloin, in between Nuits-Saint-Georges and Beaune. They first came to Kermit’s attention via the master of La Tâche himself, Aubert de Villaine and another great Burgundian producer, Bertrand Chevillon. Damien was first saluted by the Hospices de Beaune as a young talent to be watched. Kermit Lynch has been importing his wines since the 2000 vintage. This is a village classified white wine from the Gachot Monot Estate. Made from Chardonnay grapes in very limited quantities. Only 1500 bottles are produced from this plot. The wine is elegant with citrus aromas and a medium bodied palate tasting of ripe stone fruit balanced by a citrusy freshness.